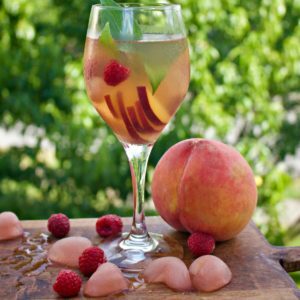 Refreshing Peach Sangria with a sugar free option. Make peach simple syrup icecubes. You can mix in some water if need be. I used a small ice cube mold. Mix 1 cup peach simple syrup, wine, St. Germain, sliced peaches. Serve with Peach ice cubes and Frozen raspberries.